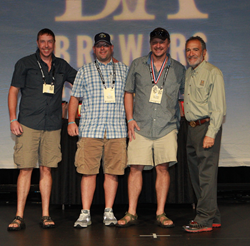 von Trapp Brewing won a Silver Medal at the Great American Beer Festival® on September 26, 2015. The Silver Medal was won in the Bohemian Pilsener (category #34) for von Trapp Brewing's Bohemian Pilsner lager. “We are very humbled to accept this award, we find it an honor to represent the great state of Vermont and its proud brewing tradition” said J.P. Williams, Brewmaster at von Trapp Brewing. von Trapp Brewing claimed a silver medal at the 2015 Great American Beer Festival (GABF) competition. Presented by the Brewers Association, GABF is the largest national beer competition that recognizes the most outstanding beers produced in the United States. The top three winners in the competition’s 92 beer categories were announced September 26 at the Great American Beer Festival awards ceremony held at the Colorado Convention Center in Denver, Colorado. “We are very humbled to accept this award, we find it an honor to represent the great state of Vermont and its proud brewing tradition,” said J.P. Williams, Brewmaster at von Trapp Brewing. von Trapp Brewing was recognized in the Bohemian Pilsener beer-style category for its Bohemian Pilsner Lager a smooth, crisp Bohemian pilsner with a harmonious blend of Perle and Saaz hops. von Trapp Brewing is a 35,000 barrel microbrewery with the ability to expand to 50,000 barrels located in Stowe, Vermont that specializes in producing the highest quality traditional Austrian-style lagers.